At age 7, Mark began his musical career playing violin, switching to guitar at age 11. Mark utilizes a progressive, unorthodox approach to guitar improvisation. 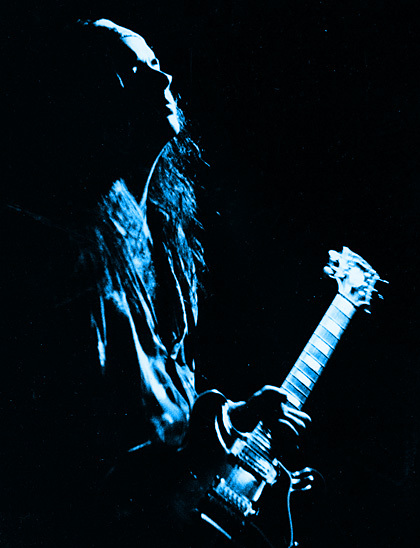 Highlighting a unique, 'outside of the box' phrasing technique while always maintaining a solid foundation in the blues, he is distinguished from other mainstream guitarists. Blending raucous, blistering rock riffs with violin-like phrasing, Mark states 'no matter where I go on the fretboard, my roots are still in the blues'. Mark's writing, recording and touring credits include: The Robin Zander Band, Rat Race Choir, Annie Haslam, Eddie Jobson, Eddie Kramer, The Tubes, Zebra, CPR, Leslie West, Tony Visconti, Richie Havens, Felix Cavaliere, Brian Johnson, Cliff Williams, Maggie Bell, John Entwistle and John Bonham.